A ninth grader's world is forever changed in Evan's holiday present to his fans. Eric is still adjusting to his family's move from California to Utah when he discovers runaway classmate Grace dumpster diving behind the burger joint where he works. A concerned Eric and his younger brother, Joel, hide Grace in their backyard clubhouse. Meanwhile, the Cuban Missile Crisis looms, and the boys' father is recovering from Guillain-Barre and their mother is overworked, so there are plenty of distractions to keep the grown-ups ignorant of the goings-on. Evans portrays Grace's heartbreaking predicament with sensitivity and also touches on how the political situation affected the era's youth (""The possibility of a nuclear holocaust was just something we always carried around in the back of our minds, like an overdue library book""). 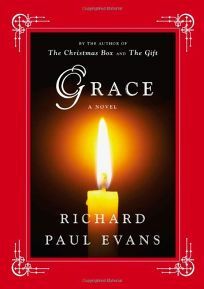 Evans knows how to pull on the heartstrings, and the conclusion to this one will have readers reaching for a hankie.